As the Swara Sonora Trio began to plan our Indonesian tour, we decided that we wanted there more of a purpose to our travels than the personal excitement of performing on the other side of the world. It was late 2008 as we ironed out details. Barack Obama had just been elected, optimism was running high, and attention was turned to the United States’ possible deeper engagement with Asia and especially with a moderate Muslim country like Indonesia (where President Obama spent part of his childhood). We titled our project the Peace Tour. It was a little cheesy, but the name stuck. 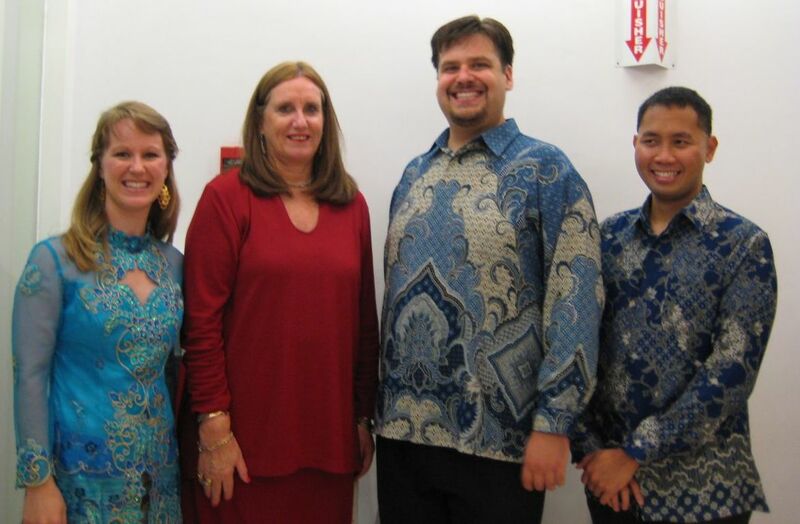 We wanted the trio to engage in significant ways that might actually promote understanding between cultures, so we came up with a three-pronged goal for our tour: we would reach out to audiences by sharing our music and our talents in performances across Java and Bali, we would connect with young musicians by teaching master classes at music schools along our travels, and we would make the tour a fundraiser for an Indonesian organization. It was important to choose a reputable organization with international recognition, so that our backers in the US would be comfortable getting on board with our fundraising. After a brief discussion we decided that UNICEF was the obvious choice because of their international reputation and their efforts towards children’s health and education in Indonesia. At UNICEF headquarters in Jakarta. Our t-shirts translate to “I love Indonesian children.” Josephine is to the left of the UNICEF flag. One of our most exciting days of the Peace Tour (it’s hard to name any one day “most exciting” because each day held new experiences, people, sights, sounds, and amazing foods) was when we visited UNICEF’s Indonesia Country Office headquarters in Jakarta. We’d been connected with Josephine Lapod in the office there, and had a formal agreement to turn over all our funds beyond expenses to support UNICEF’s children’s programs in Indonesia. 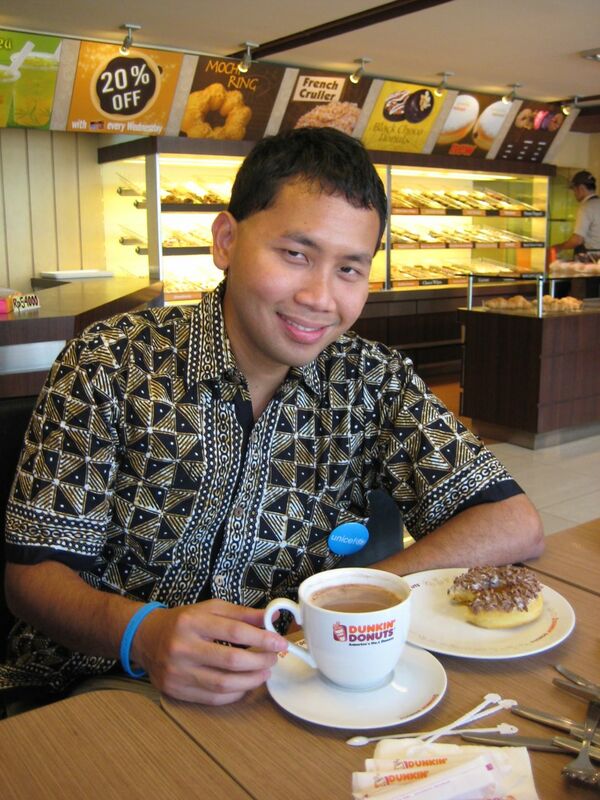 Josephine took us to the Dunkin’ Donuts (a very popular chain in Indonesia; the menu is similar to in the US except you can get durian-filled donuts and coffee with sweetened condensed milk) on UNICEF’s campus to get to know each other and to sign our contract. Then we toured their offices, met the rest of the kind and professional staff, and posed for photos wearing our UNICEF t-shirts. Unaccustomed to men as tall as Nathan, they’d had to special order his t-shirt size and it had arrived just in time for our visit. The staff told us that the last visitor they placed a custom order for was Bill Clinton! Thanks to many generous donors in the United States and the help of our fiscal sponsor Fractured Atlas which allowed us to raise tax-deductible funds, we gave $1,500 to UNICEF’s Indonesia Country Office. In the scope of the organization’s total budget that wasn’t a ton of money, but in a country like Indonesia it can buy a lot of vaccinations and school supplies. 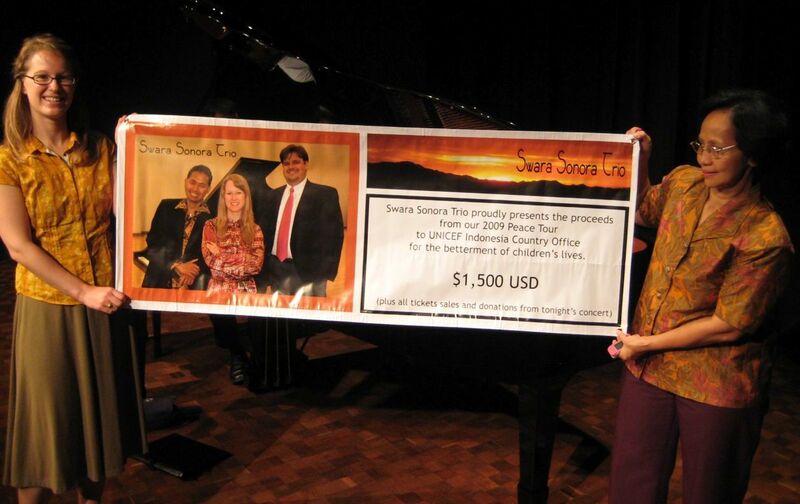 At our Indonesian premiere concert at Jakarta’s Erasmus Huis, we presented the funds with our version of the oversized check you sometimes see given to organizations at charity events. Thanks to the tireless efforts of Aryo’s mother Erni, who asked for support from friends, family and corporate sponsors there, and donations collected at our Jakarta concert, we raised another $1,500 in Indonesia which Ibu Erni brought to Joesphine after our Peace Tour ended. I’m proud that our trio worked hard at fundraising so we could leave a lasting effect, however small, on the children of Indonesia, and grateful to all the people who helped us and gave to our project. We wanted to forge connections with our tour. One new relationship I didn’t expect was my own connection to UNICEF. Now N and I give a monthly automatic contribution to UNICEF, and I see that as being a lifetime commitment of mine. And it all began with a brainstorm about how to add purpose to our group’s travels. I think we found some purpose.